Note: I don’t review substandard books. I read a lot. I don’t have a lot of time to review books, so what I do share, I’m sharing because the book has been very influential and helpful to me in my life, and I believe it will also help others. If you are a marketer or entrepreneur, these are must reads. You’ve already heard most of what’s in this book, you just didn’t realize it all came from one guy. Tags: Behavioral economics, psychology, marketing, sales, managing, HR, people, relationships, thinking, understanding yourself, others, your business, why people buy from you and why they don’t. You know everything and are rational in all your thoughts and decisions. You’re into using data and science to improve your business. Your job involves interacting with people. You are a writer and want to know how to create more compelling content. You enjoy thinking about how people think. You manage a company, department, or team. You work in marketing or sales. Anchoring. Think of a number between 100 and 200. Now, how much would you pay for a yearly Amazon Prime membership? Whatever your answer happens to be, it’s higher than what it would be if I had asked you to think of a number between 10 and 20. When we are exposed to a number or set of numbers, and then asked a question involving other numbers, even if the first set of numbers has no relation whatever to the question, it will affect how we respond. Who proved this through scientific experiment? 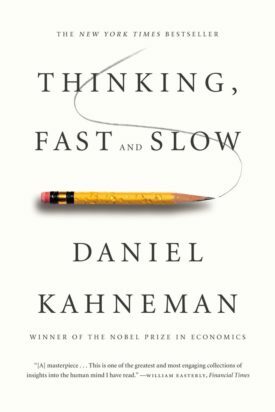 Daniel Kahneman (and his late partner in crime, Amos Tversky). Loss aversion. Studies show people care about avoiding loss about twice as much as they care about getting something. Who came up with this theory and proved it? Kahneman. Planning fallacy. According to Wikipedia, the planning fallacy is “a phenomenon in which predictions about how much time will be needed to complete a future task display an optimistic bias (underestimate the time needed). This phenomenon occurs regardless of the individual’s knowledge that past tasks of a similar nature have taken longer to complete than generally planned.” Every been involved with an engineering project? Then you’ve experienced this. You have Kahneman to thank for it being a recognized psychological thing. What’s fascinating about the book is how many of these types of things came from the work of Kahneman and his cohorts. As you read the book, you’ll recognize theories you’ve heard about all your life, and by the end you’ll be saying “I can’t believe this one guy was involved in all this stuff!” The next thought you’ll have is “I need to read this again and figure out how to really apply it to what I do.” Read the book, but have a spreadsheet or piece of paper handy to write down your ideas about how you can apply Kahneman’s work to your own work. I guarantee you’ll have more ideas than you know what to do with. The be fair, what’s in this book was a team effort. Amos Tversky, Kahneman’s friend and partner in crime, died in 1996 at the age of 59. Had Tversky lived, he would have shared the Nobel Peace Prize Kahneman won.